Mind you the track looks rather neat to start with. This is Gauge One, yeah? That Stable block is impressive. All looking very promising Mikkel, afraid I can't help with the colour of the bowser, anything in HMRS ? Nothing in HMRS that I can find. Depends how it would be classified. Like barrows and trolleys maybe? If so then brown. Or if associated with water cranes, then the stone colours. Rummaging on! Good to see a wagon free from ambiguity and uncertainty! As for the Iron Mink, I have begun to think that the photo is from the "livery trials" mentioned by Atkins et al. But it might well still have carried the livery in operation - we know that some stock did. In fact Slinn says at least one wagon built as late as 1905 (sic) was fitted with plates, although he doesn't say which one! Thanks Dave, yes good old whitemetal has such nice built-in weight. I really ought to have more of the earlier outside framed wooden vans, but David Geen doesn't seem to be too enthusiastic about overseas orders anymore - in his case for understandable reasons. Haha, I think the lack of scenic detailing (and associated give-aways) is helping here. And maybe the depth of field, which comes from combining two identical photos with different depth of fields in Zerene Stacker. Thanks SS, it is certainly a larger structure than the smaller type I had originally planned. In fact it looks a bit out of place on the current layout, so am thinking of using it on the next layout instead (this keeps happening with my buildings!). Stunning work, both the stables and the yard. I was looking at pictures of a GW layout in RM, thinking it was 4mm/EN when in fact it was 2FS. So, I get Corbs's point, that yard shot should be at least 7mm scale. Regrettably the Mike's Models water bowser appears to be no longer available and enquiry emails to Holt Models have not produced any replies. 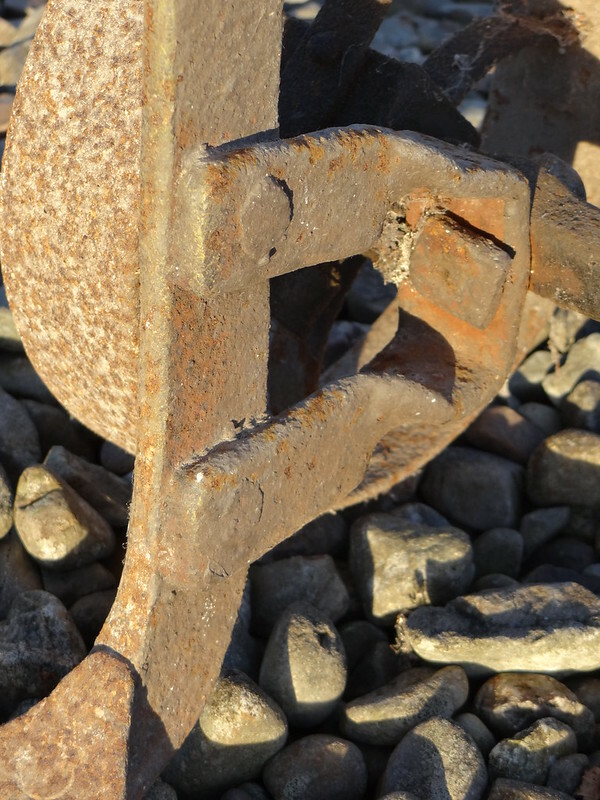 As they were made from iron, then whatever colour the railway used for ironwork on trolleys and barrows would seem the most likely choice. I think the LNWR painted theirs black, although dark brown would be a possibility. Would a bowser be classed as station 'furniture' though? Possibly, although I expect that they could have used any of the company's "standard" paints. The LNWR used carriage "Lake" on platform barrows and trolleys, but with black for the iron parts. For the GWR, Great Western Way says chocolate or dark stone with iron work "at some time" black for barrows. So I scurried off to look at Mikkel's blogs. Totally off the point but it reminds me of a rather grand old lady who lived in Artillery Mansions in Victoria Street, London, who used to take her siamese cat on a leash to the green space next to New Scotland Yard where pigeons (and winos) used to gather. She would encourage her cat – it didn't take much encouraging – to stalk and attack the pigeons though I never once saw it catch one. My photo was actually taken on a very hot afternoon in Venice. The cat seemed pleased to have found the shade of the lamp-post, rather than chasing around in the heat. 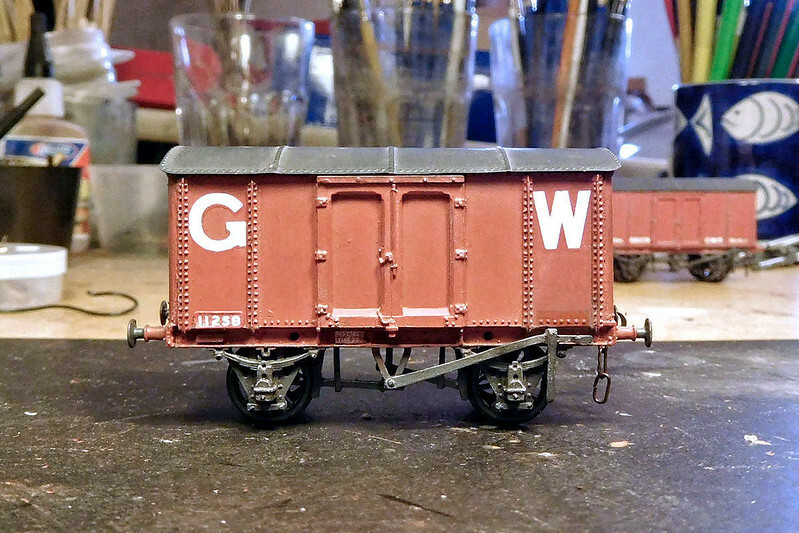 Well, for the Great Western, it seems we know the numbers assigned to wagons of each lot, but colour and lettering is debatable. For the Midland, we know they were grey with M R on the side, but as to numbers we've hardly a clue. Fortunately, that doesn't matter too much as the number is only in very small digits on the solebar plate not painted 6" high on the side of the wagon! I'm doing some steam locomotives from the Pre-Grouping Era in 00 Gauge. I've done an L&YR Class 25 0-6-0 and an North Staffordshire 0-6-2T is in development. Many thanks! The RM layout sounds interesting, do you remember which one it was? Regrettably the Mike's Models water bowser appears to be no longer available and enquiry emails to Holt Models have no produced any replies. Black does seem logical from a practical point of view. Though perhaps not aestethically pleasing, and if the bowsers were kept on the platform I suppose a less austere colour might have been chosen. 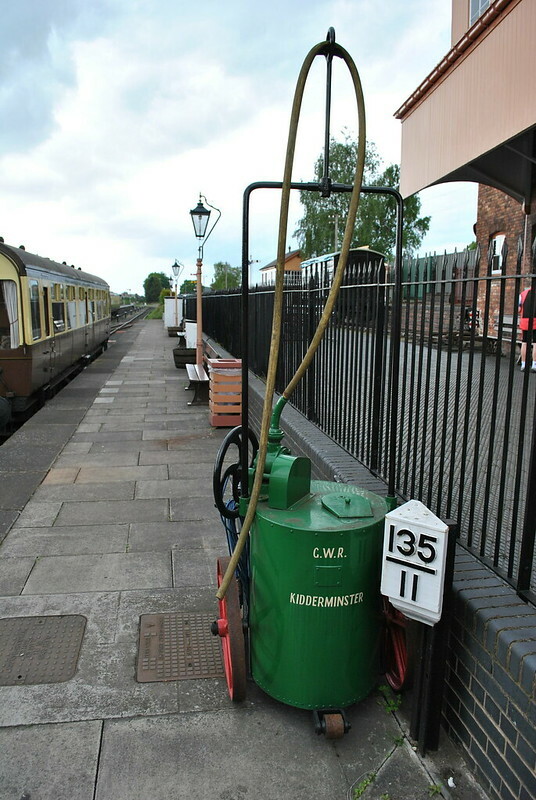 Here's the other SVR water bowser, the one at Kidderminster. Same livery, so someone had a plan. Although I suppose it's likely that a colourful paintjob was chosen to brighten up the platforms. I think I used GW Way (Slinn's original version) as a source for the livery on the barrows and trolleys on the bay platform. Not sure I got the colours distributed in all the right places though! ... or is this a last survivor of Wolverhampton green? I just painted mine dirty black with metallic/rust/dirt highlights but it was meant to represent a broken one! Yes it is all about colour. I wonder if these images help. 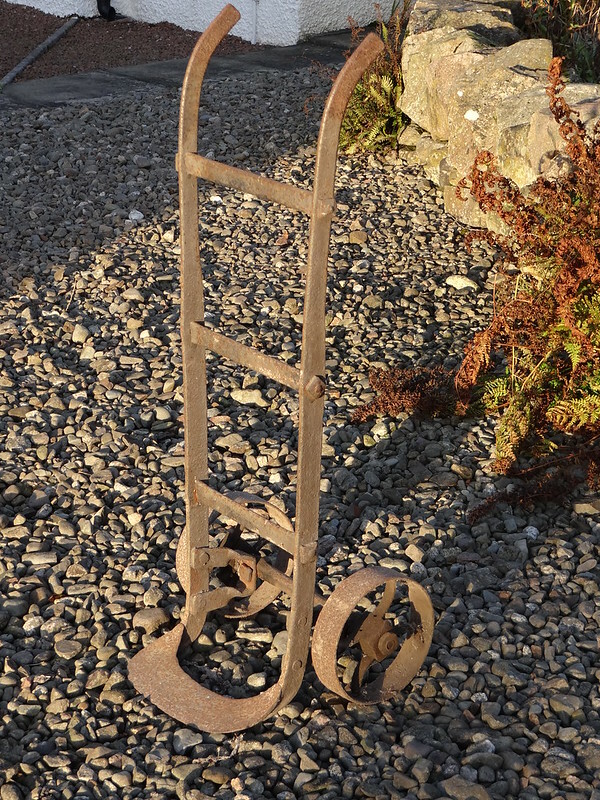 We think a Porter's Trolley. Knowing where we got it from it might have come from Liverpool and the docks. 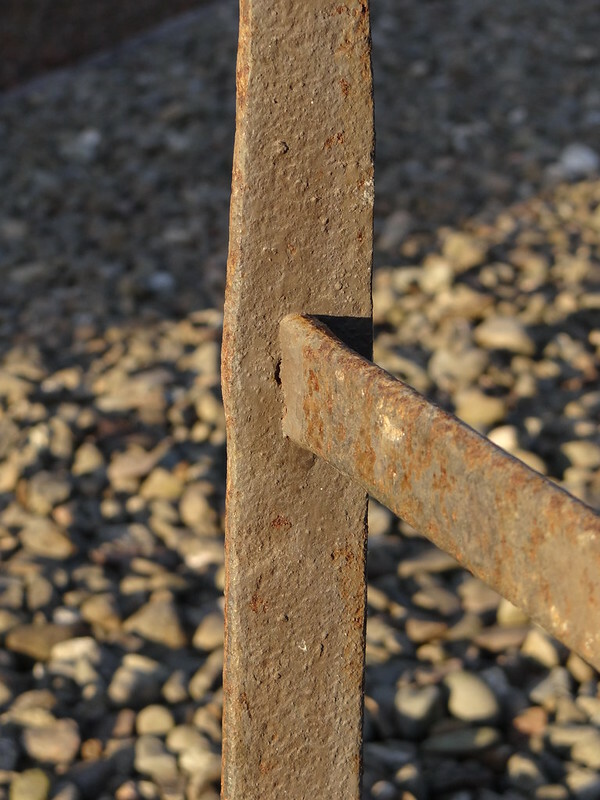 In between the outbreaks of rust it appears to be painted grey - a precursor to Hammerite 'grey'. GWR sack barrows and trolleys were brown. There are plenty still around with original GWR markings on them in private collections. BR(W) were in no hurry to repaint them! Thanks gents, very interesting photos. I hadn't seen any photos of a water bowser in use "back in the day" before. I'll paint mine black then, it seems to make good sense. I like the design of that porter's trolley/sack truck, it's quite elegant compared to other types. Most sack trucks I have seen in photos from GWR days were of wood for the main structure - hence the brown colour - with a metal tray in some cases. No 11258 is now done, awaiting just the Sprat & Winkles. The van is shown in ca. 1904 condition with extended vent bonnets, hybrid livery and a dark patch where the “G.W.R” cast plate used to be - as depicted in Atkins, Beard & Tourret page 369 (1998 edition). I was surprised to see the cast plates fitted over the rivets. The large 25” GW letters were introduced in 1904. However, photos show that some wagons had the large new letters and the old cast plates at this time, although the right hand “G.W.R” plate was removed. Even some new builds had this hybrid livery. Of particular interest is O2 no. 29301 depicted on page 297 of Atkins et al, carrying large “GW" and cast plates. That wagon was supposedly built 1906 (! ), indicating that the hybrid livery existed on some stock at least 1904-1906. 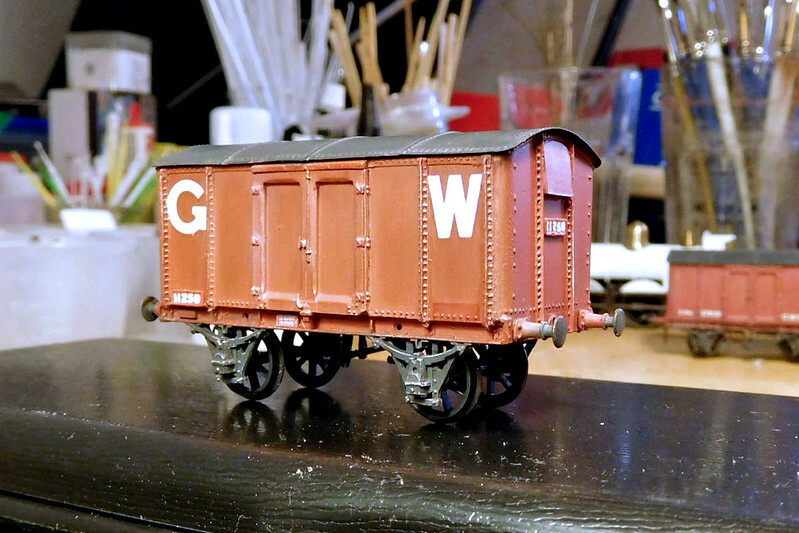 Some wagons in the hybrid livery appear to have had a full repaint when the 25 inch “GW” letters were fitted, see e.g. the cattle van on page 417 of Atkins et al. We must assume that these repaints were grey, since that was the new colour introduced along with the 25 inch letters. However, the photo of No. 11258 - which served as the basis of my model - has that intriguing patch where the right hand cast plate used to be. To me this suggests that Swindon simply applied the new 25 in “GW” directly on to the existing paintjob, and removed the right hand “G.W.R” cast plate. Since I believe that GWR wagons were red until 1904, then in my view the van in the photo is red, and the patch unweathered red. An alternative interpretation is that the photo of No. 11258 shows it in freshly painted grey livery, but this would mean that Swindon first painted the whole wagon grey and *then* removed the right hand cast plate, leaving the dark patch unpainted. This does not seem logical to me - unless of course human error or a change of plan was involved. Thanks to all for our earlier discussion of this. How did you make the plates (including the solebar plate)? Although I've gone along with it, I'm still doubtful about grey roofs for red iron minks. The roof is made of iron or steel sheets, so logically should be painted the same as the rest of the body, if the purpose of paint is to prevent corrosion. Agreed after a while in service the roof would acquire more soot and grot than the sides. Wooden vans (in the grey era) started out with white roofs - postulated white lead-based paint as a waterproof paint suitable for canvas; by this logic the roofs of grey minks should be wagon grey too.